Crafting Queen: Mojo Monday challenge - Too late though! so after a long time i decided to participate in Mojo Monday challenge only to realisie am super late to send my entry!! but no worries i loved the sketch and i tried something new. 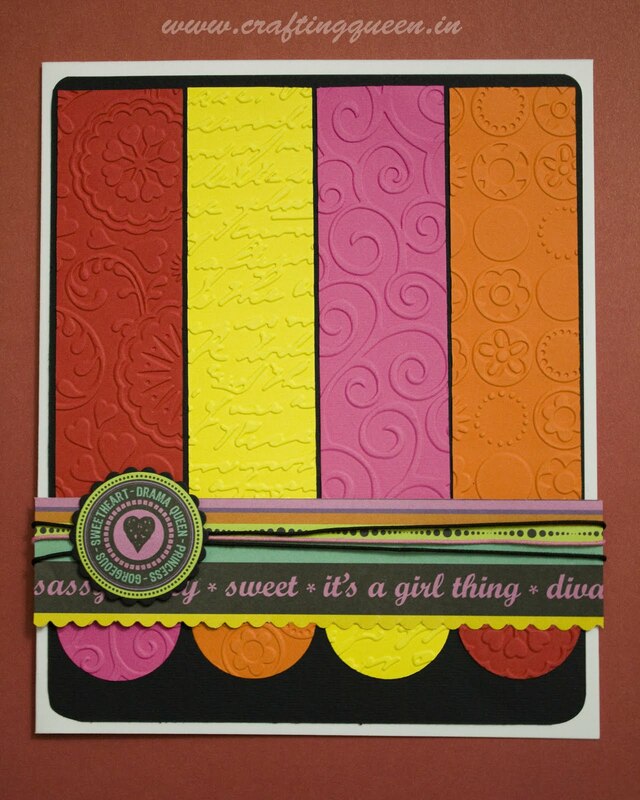 I took the idea of embossed pattern from Erum's this card. I love Erum's creations and find her very inspiring!! You must have a look at her Blog to see all the beauties she has made till date! So better late then never! Here is my take on the last week's sketch :P i wanted to use all the colours below so thsi is what i came up with. Added the black in background to empasize on all the brigthness!! wow.. i am placing a custom order for this... kindly email me the price...!! This is superb!! simply superb!! 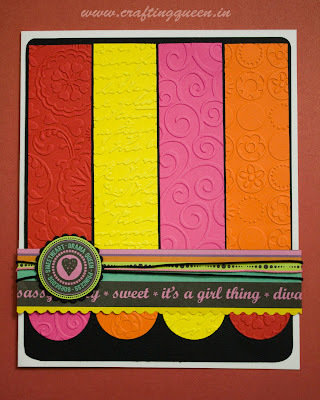 love how you made this card..
it is just awesome.. love the colors..
very nice and clean card!! Oooh thats a rainbowlicious goodness! LOVE the way you swapped the scallops, brilliant idea! The band looks awesome with that mini circle and heart. The black rally emphasizes the colours even more. Brilliant Karuna! Thanks for the mention, you are a sweetheart! This is so pretty! Love the colors. Thanks for playing Mojo Monday!